I really like the physical models built for the photograph -- today it seems everyone uses in-game images or CG artwork, but back in the early 90s someone had to sit down and build this zombie trio by hand, throwing in what appear to be a Hot Wheels car, a model train crossing sign, and a dollhouse TV set for good measure, all set up in front of a "real" 2-D background, i.e., not composited in Photoshop. I like that one of the zombies resembles Tor Johnson, and that the most skeletal one has such good posture. 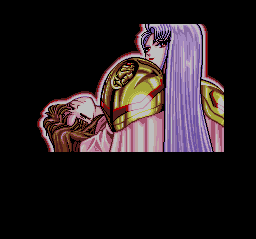 I also appreciate the background reference to classic Japanese art and the original concept -- the game casts the player as the disembodied floating head of a deceased Japanese warrior, though the written ad copy doesn't mention this at all. 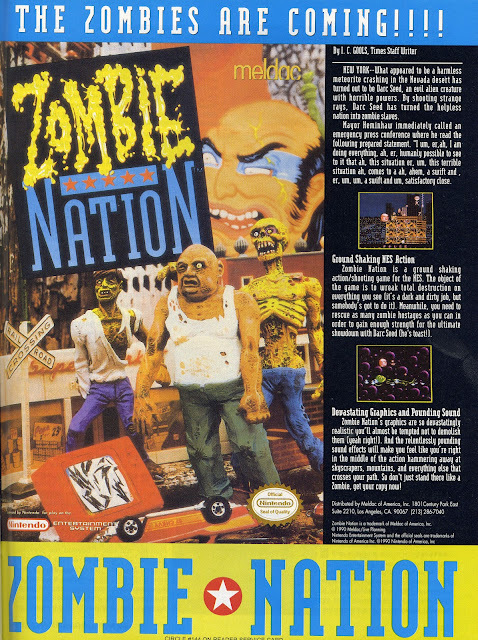 I am pretty sure Meldac grafted the whole zombie theme on for U.S. marketing purposes, as the game itself is a bizarrely illustrated side-scrolling shoot-'em-up that doesn't specifically bring zombies to mind. But there they are -- THE ZOMBIES ARE COMING!!!! complete with Devastating Graphics and Pounding Sound. By 1990 standards, of course -- Ground Shaking NES Action tends to register fairly low on the Richter scale. 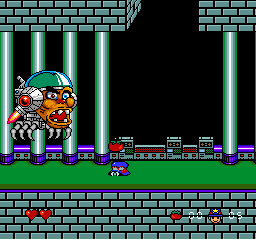 And there are oversized, comical bosses to deal with -- they're not too hard to defeat, but considering this is all crammed onto a cartridge, the detailed animation is impressive. There really isn't a lot to be said about Makai Prince Dorabbochan. It's a simple, cute, perfectly competent platformer, with solid controls and reasonably challenging action, and the creepy, colorful graphics look very nice. And it's a lot of fun for a while, but there are better such games available, and it falls a little short of true classic status. I enjoyed my time with it, but if it weren't for the horror theme, I'm not sure I would have ever given it a second look. It's Halloween week here in the States, and at least a few of the downloadable console games listed here are seasonally appropriate. And four of them have semicolons in their titles! WiiWare -- One new title, first in what appears to be an intended series: Anima: Ark of Sinners, a side-scrolling action RPG set in the world of the Spanish role-playing game system Anima: Beyond Fantasy. I'm not sure if it's much of a challenge, though, as Nintendo's promotional webpage promises "Exiting adversaries." DSiWare -- Two new titles this week: Academy: Checkers, which attempts to dress up the basic, classic game with some customization features, and Halloween: Trick or Treat, a hidden-object game. 3DS eShop -- The 3DS gets the two DSiWare games, as usual, plus two more: Burger Time Deluxe, the 2-D black-and-white, visually restyled Game Boy version of the classic Data East arcade game, plus Pyramids, a new 3DS puzzle/platform game with an archaeology theme. XBox Live Arcade -- Three new games this week: Sega's classic coin-op racer Daytona USA arrives in remade HD glory, as well as The War of the Worlds, a stylized H.G. Wells-inspired side-scrolling platformer with narration by Patrick Stewart. For Halloween fun, there's Konami's Zombie Apocalypse: Never Die Alone, yet another twin-stick shooter carrying on the legacy of Robotron: 2084 in the HD/multiplayer/zombietastic era. PS3 on PSN -- Four new games are available -- see above for details on Daytona USA and Zombie Apocalypse: Never Die Alone. PixelJunk SideScroller brings the retro-styled series to classic platforming, and Worms Crazy Golf is a minigolf/puzzle game featuring the classic Worms characters and cartoon violence. PSOne Classics -- A quiet week here. 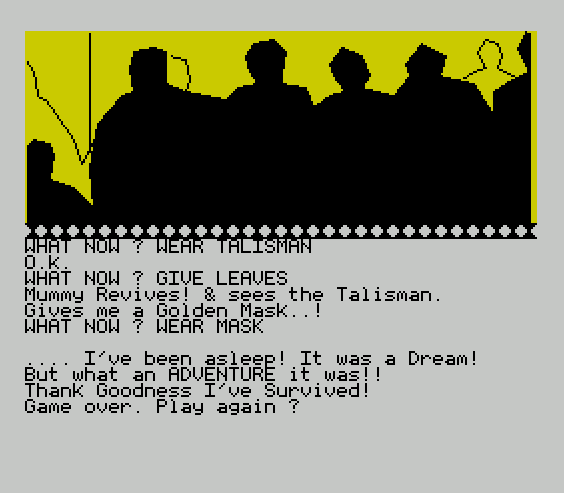 This Halloween week, I'm continuing a recent trend and filling in more gaps in my coverage of the SoftSide disk magazine adventures, with SoftSide Adventure #8 - Windsloe Mansion Adventure, published in January of 1982. It seems apparent that the game was meant to come out closer to Halloween -- it's filled with traditional monsters and spooky (not horrific) references, and the very plot as stated in the intro text sounds seasonal: The world famous 'Pumpkin Man' has been kidnapped and is being held prisoner in the dungeon of Windsloe Mansion. 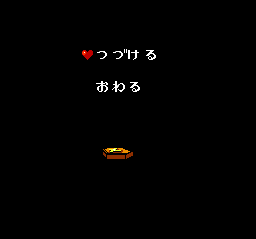 The introductory screen goes on to inform us that the player's goal, as we might have guessed, is to rescue the Pumpkin Man and return him to our starting location, making use of the neighboring Blair house which is connected to Windsloe Mansion. We earn points for killing or dispelling the monsters and rescuing the Pumpkin Man; the highest possible score is 230. (It's an interesting historical coincidence that Mrs. Windsloe is reputed to be a known witch, and there's a Blair house involved... more than a decade before The Blair Witch Project.) There's no onscreen or code-level author credit, but some sources attribute this game to Steven Neighorn. 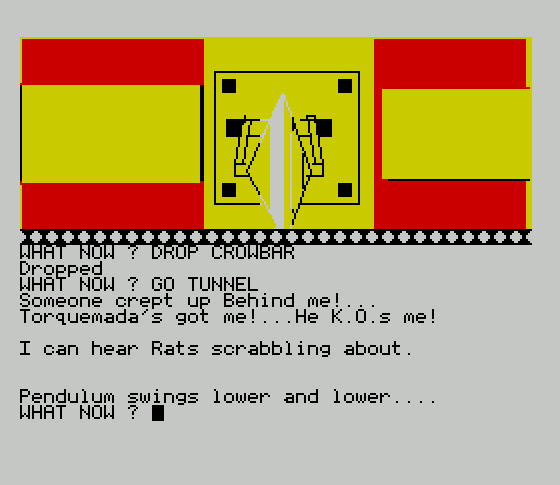 The game opens with a PLEASE WAIT...INITIALIZING message uncommon to the SoftSide series, and the interface is also quite different, resembling Brian Moriarty's approach in the games he created for ANTIC magazine before he moved to Infocom. 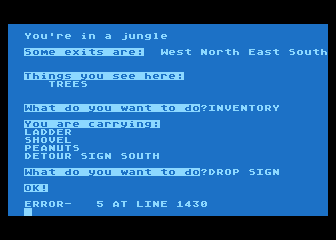 A VISIBLE OBJECTS window alternates with the player's INVENTORY display, and as there's no room for scrolling we usually have to hit the return key to acknowledge messages from the game. We begin standing on a sidewalk outside the Blair house, and we should note our location since to win we have to return the Pumpkin Man to this very spot. We have some money available, which we can discover only by using the I command, not INV or INVENTORY. This town seems to have no zoning regulations, as its residential areas are haphazardly intertwined with the commercial district, filled with many shops, none of which have more than a single item on offer, and only a few of which insist on payment, as it turns out. To the immediate south of our starting point is a Chinese restaurant containing a fortune cookie. We can't OPEN COOKIE or READ COOKIE or EAT COOKIE -- IT'S BEYOND MY POWER TO DO THAT! in this last case, which seems strange, but maybe that's why this restaurant has no customers. It wasn't until much later in the game that I figured out we have to SMASH COOKIE to get at the Chinese Proverb inside. It reads, "DON'T BE FOOLED BY A HALLOWEEN PRANK THIS YEAR. WATCH OUT FOR THEM APPLES!" -- which sounds more like a Kentuckese Proverb. There's a HALLOWEEN APPLE on the sidewalk outside the Blair house, but by the time I got around to reading this message, I didn't need the clue anymore. Still, I had to confirm that if we EAT APPLE, then I'VE EATEN A RAZOR BLADE! I CAN'T CONTINUE THIS ADVENTURE! A Lumber Shop contains a wooden stake, so we may conclude that we'll need to deal with vampires too. Despite the intro text, which mentions a husband and wife owning the Windsloe mansion, a room description later places us ON A SIDEWALK OUTSIDE OLD LADY WINDSLOE'S MANSION. (We will find evidence of Mr. Windsloe's existence later in the game, however.) We can't get into the house this way, but a device called an AUDIOTEX III is sitting on the Windsloes' front porch. We can LOOK AUDIOTEX (there's no EXAMINE verb here, but LOOK works to reveal more detail, unlike other SoftSide games) to learn that it's a UNIQUE SAFE CRACKER. So that should be handy, should we encounter a safe. Dave's Tobacco Shop appears to be empty. The Pharmacy contains a vial of poison, like the old-fashioned apothecary, apparently; the really old-fashioned kind that served the Capulets and Montagues, I mean. And the Plaid Pantry store contains a can of dog food. The GUN'S [sic] UNLIMITED STORE has a .45 automatic for sale. And unlike most of the other stores, if we just go ahead and GET .45, we are busted for shoplifting and the game is over. We have to BUY .45; in fact, if we try to BUY GUN we are incorrectly told that THE GUN DOESN'T COST ANYTHING! We can run around and SHOOT things, even if we don't have the gun in our possession yet, which reveals a key detail about the gun's intended use, as we learn that SILVER BULLETS ARE NO MATCH FOR A [whatever it was we attempted to shoot]. Having toured the neighborhood, it's time to explore the Blair house. Kitchen has a note reading, "GIVE TO DAVE." Presumably this refers to the note itself, and not to some sort of charity -- and ah, yes, we can GIVE NOTE in Dave's Tobacco Shop to obtain a packet of Tobacco. We can't OPEN PACKET, but we can LOOK PACKET to find a key. If we do so a second time, however, the key returns to the floor of the current room, and the game doesn't remove it from the inventory count, which soon causes item limit problems. So we should try to avoid this. The Blair house's game room contains a cue ball and some... POISONOUS DARTS? Interesting games these people play. The storage room to the south provides a pool cue, and the attic to the north features a crowbar and steel sword. All of these things seem potentially useful, but our inventory limit grows tight before long and we will need to figure out what to do with some of these things before we haul them around. The Blairs are hosting a party, apparently, as there is a party room filled with people. And there's a safe in the Blair bedroom. The bedroom closet leads into an underground passage, where we run into a ghost, and at the end of the passage we find a storage room, and a tool room with a crucible and mallet. There's a razor on the ledge outside the tool room, perhaps left there by someone suicidally indecisive. To the south of the tool room, we suddenly find ourselves inside the Windsloe house's master bedroom. Another ghost is in the bedroom closet (no skeletons though). And a book in the library reads, "BURN WITCH WITH FIERY STICK!" -- rather an odd book to have in the home of a purported witch. There is a convenient stick in the parlor, which seems even stranger. The maid's bedroom has a bed, but no maid -- all we can do is MOVE BED to find a trap door. If we choose to OPEN DOOR, then A HAND REACHES UP AND PULLS ME THROUGH THE DOOR. IT'S THE MOSS CREATURE! We need to act quickly here -- if we try to leave the room or do anything else that the designer doesn't want us to, we learn that THE MOSS CREATURE HAS HUNGRILY CONSUMED ME! We need the bottle of acid from the Windsloe kitchen - we can THROW BOTTLE to destroy the moss creature, though why it doesn't work on anything or anyone else remains a mystery. Beyond the Moss Creature we encounter a Vampire, so we can guess that we need the wooden stake and mallet, but given inventory limitations I didn't have them with me at the time. If we encounter the vampire and are not ready to deal with him, any wrong move means THE VAMPIRE HAS SUCKED MY BLOOD! and the game is over, so I chose to come back here later. The Entertainment Room has a pinball machine, though we can't seem to do anything with it at first or even find out what sort of machine it is. Related to this is a head in the bathroom with a sign reading "SHAVE ME." What does shaving the head get us? Some puzzle solving, at first -- it seems that having the razor is not enough, but we can CUT the Halloween APPLE to obtain the razor blade inside. Chilling! Even with the razor and blade, though, we can't SHAVE HEAD. We also can't INSERT BLADE or USE RAZOR or LOAD RAZOR -- we must PUT BLADE - IN WHAT? - RAZOR. Now we can SHAVE HEAD, and... THE HEAD THANKS YOU AND A QUARTER POPS OUT OF HIS MOUTH! Quite a bit of work for two bits. A werewolf in the MUSTY DARK ROOM south of the Kitchen tears us apart if we try to go past him, or, again, fail to do exactly the right thing. I wondered if we could possibly dispatch the werewolf with poisoned dog food -- disrespectful, I suppose, but it seemed like a possibility -- so I went back to the Plaid Pantry and found that we have to BUY CAN, not GET CAN, which again gets us busted for shoplifting. But with the can of dogfood and the vial of poison in hand, I still couldn't figure out how to combine these items. And we can't seem to SHOOT WEREWOLF despite the gun's silver bullets -- though this was a red herring, a misleading impression engendered by the game's standard response text. There's a broom in the Windsloe house's closet, though I never found a use for it. I was running out of ideas, so I wondered if we could use the AUDIOTEX III to crack the safe in the Blair bedroom. But it seems we can't CRACK SAFE, OPEN SAFE or UNLOCK SAFE. Hmmmm. Back to kill the vampire, it took me several restores to discover that we have to HAMMER STAKE; I died numerous times frantically trying to USE STAKE and STAKE VAMPIRE and USE MALLET, all to no avail. Once I knew the right command, I learned that we can try to HAMMER STAKE before we run into the vampire to get a hint that most players will find useful only in hindsight: THERE IS NO VAMPIRE HERE, SO WHY HAMMER THE STAKE! Beyond the vampire, we find a room adjoining the dungeon; the door has a lock requiring a key. The Circuit Control Room contains a coil of rope. The Utility Room in this area contains a toad, and a KILLER DOG, so we can guess that the poison and dog food must be meant for this situation. Figuring out how to use the poison is tricky, again due to parser limitations and the fact that THE DOG HAS TORN ME TO SHREDS! if we don't know what to do immediately. The parser uses specific text strings for comparison, and is annoyingly inconsistent here -- we have to BUY CAN (not BUY FOOD) but we have to POISON FOOD (not OPEN CAN or OPEN VIAL or POUR VIAL or POUR POISON or POISON CAN) to produced POISONED DOGFOOD. We cannot, apparently, drop our handiwork after this point -- at least, we can't DROP POISONED or DROP FOOD or DROP DOGFOOD. All we can do is FEED DOG. Going back to the safe, I learned that if we try type a long command line (e.g. OPEN SAFE WITH AUDIOTEX) that wraps around the end of the display line, the whole display gets out of synch by one line, looking odd from that point on. To open the safe, we have to PUT AUDIOTEX - ON WHAT? - SAFE. This reveals a Magical Amulet, and also reveals that the parser does occasionally get a little more ambitious, but the purpose of doing this is not clear. We can't WEAR AMULET, and I never found a reason to bother with it -- perhaps it was meant for an idea that never quite got implemented. Back to the cellar to finish off the moss man, vampire and killer dog, I learned that we can't get out of the cellar until we finish killing most of the monsters down there, and we need the key to unlock the dungeon door. Or rather, not UNLOCK DOOR or OPEN DOOR or UNLOCK LOCK or UNLOCK DUNGEON, but... INSERT KEY! Dang parser. So we need to come down here with a full load of very specific inventory. And in the Dungeon we find... the famous PUMPKIN MAN! We never do learn what he's supposedly famous for -- perhaps it's the fact that he's very portable, as we can just put him in our inventory. But we still need to find a way out of the cellar -- I thought perhaps I'd arrived at the finale a little too early, but we can THROW ROPE (which normally drops it, but it seems we can't SWING ROPE or CLIMB ROPE) to get back up to ground level. And then we just have to walk back to the starting location -- as soon as we arrive there with the Pumpkin Man in tow, victory is ours! But we're missing quite a few points, with 135 out of a possible 230, and the clues found along the way suggest that we have some killing left to do. We can then PUT INGOTS - IN WHAT? - CRUCIBLE in the Tool Room. Presumably this will let us actually make the silver bullets alluded to earlier, since the .45 doesn't seem to do us any good against the werewolf. We aren't told that there are also bullet molds handy, so it's fortunate all we have to do is POUR SILVER to make this work. Then we can load the gun with the silver bullets and SHOOT WEREWOLF.... or at least it seems like we should be able to. We can't actually LOAD .45 or LOAD GUN. It seems like we really are supposed to SHOOT WEREWOLF, because if we're in the room with the creature, that command yields I CAN'T DO THAT... YET! while anything else leads to immediately being ripped apart by the werewolf. We have to LOAD BULLETS, then we are finally informed that GUN LOADED! Now at last we can SHOOT WEREWOLF, and get 20 points for our trouble, and now we can get to WITCH WINDSLOE'S EVIL SPELL ROOM, where we find... an incubator? The witch isn't here at the moment, but we can surmise that we're probably going to need a way to light the stick on fire. We can INSERT QUARTER in the pinball machine -- and, oddly, TWO PIECES OF FLINT FALL FROM THE BOTTOM OF THE MACHINE! So we can presumably make a fire now. But we can't MAKE FIRE or LIGHT STICK or BURN STICK or START FIRE. We must RUB FLINT -- and then FLYING SPARKS IGNITE THE ALCOHOL SOAKED RAG ON YOUR STICK! The Windsloes really don't protect themselves very well, what with all this witch-burning paraphernalia in the house. What else? Well, we still haven't done anything with the cue ball, pool cue, sword, or poisonous darts. LOOK CUE reveals that THE POOL CUE IS A DART SHOOTER! We can BLOW DART anywhere we please, but it's no good against the giant wasp in Mr. Windsloe's taxidermy room or the werewolf. The ball LOOKS MORE LIKE AN EGG THAN A BALL! Okay... now we know what to do with the incubator. We can kill the wasp with the sword (not KILL WASP, but SWING SWORD) and THE WASP FALLS TO THE FLOOR IN TWO PIECES! We don't gain anything but points for the effort, however. There's an incubator in Witch Windsloe's evil spell room. We can PUT BALL - IN WHAT? - INCUBATOR, and THE EGG HATCHES INTO A HIDEOUS ALIEN. We can BLOW DART (at last!) to take the alien out with a dart to the heart. Beyond the spell room is WITCH WINDSLOE'S EVIL WORSHIP ROOM. There are some chemicals here, along with WITCH WINDSLOE. As before, if we don't act fast and BURN WITCH, then THE WITCH HAS TURNED ME INTO A FROG! So we need to have the fiery stick in hand before we enter her lair. Windsloe Mansion is one of those early, nonsensical adventures -- there are lots of puzzles, but many are incidental to the main plot, such as it is. The parser is problematic because so many puzzles depend on very specific phrasings, so even when we know what we want to do, it's hard to convince the game to let us do it. But I enjoyed the adventure and it seemed just the right choice for the Halloween week. My full walkthrough is below the fold. Robert Nicholas' Project Omega appears similar to the historically-inspired civilization management games like Hammurabi, transplanted to outer space in this case. 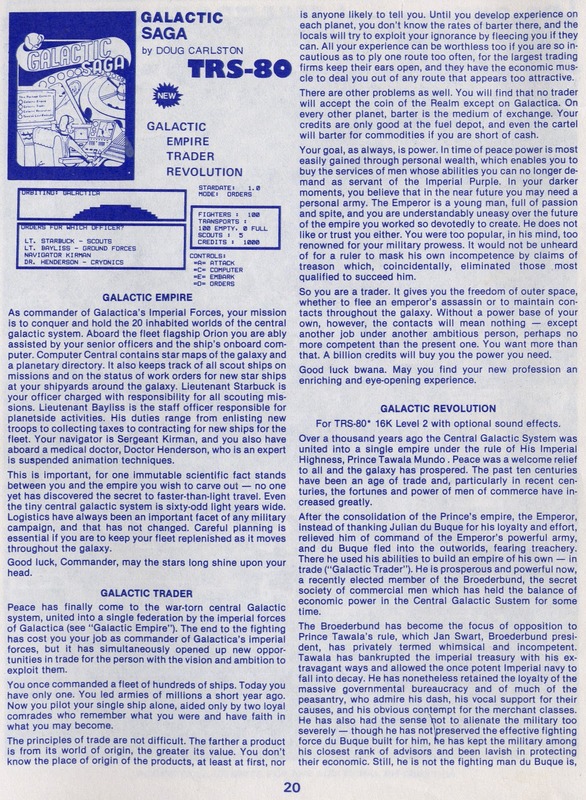 SimuTek is a collection of five smaller action sci-fi games, including a completely unlicensed rendition of Star Wars' concluding trench battle, and the ad layout features a truly unusual feature for the time -- a screenshot, revealing more about the (often disappointing) actuality behind the glowing descriptive copy. Golf, a treasure hunt, Conway's classic Game of Life simulation, and military wargaming are all represented here. Shark Attack is the closest thing to a unique title, and appears to be a simulation rather than an action game. I often wonder how many copies these games sold -- in today's market, hit titles sell millions of copies, but according to Wikipedia the original TRS-80 Model I sold about 200,000 units, so there were some natural constraints on the 1980s marketplace. Similar, technologically superior games are available today at far lower prices -- so while the good old days were fascinating, the best was yet to come. I don't know that the same can be said for this catalog, but there's still more to look at here, and we'll continue next weekend. We're continuing our page-by-page review of the Spring 1981 Adventure International catalog. Scott Adams' pioneering computer software company was founded to publish his classic adventure games, but marketed many types of products. Zossed in Space (With Graphics, even) was written by Jyym L. Pearson, best known for the Other Ventures series, and appears to be another game in the Star Trek simulation sweepstakes, one of many attempts to convert and improve the classic mainframe space game. 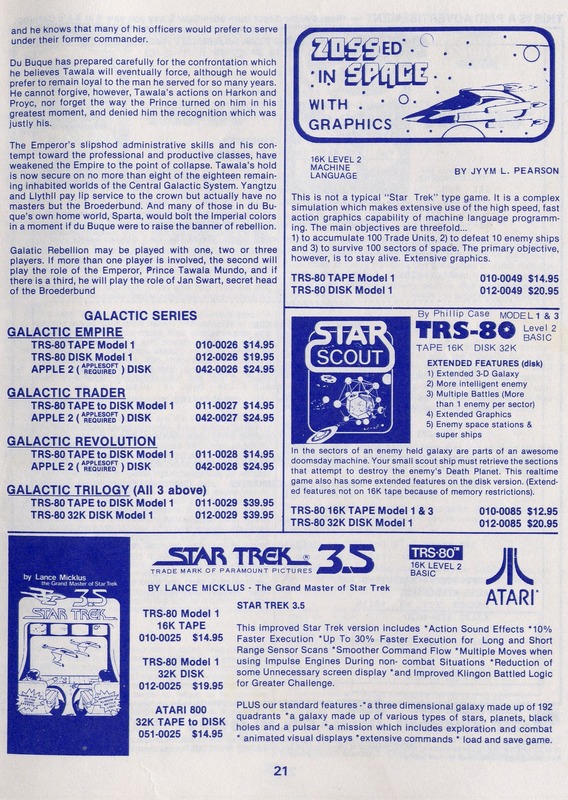 Star Scout sounds more like Atari's 1979 Star Raiders, and Lance Micklus' Star Trek 3.5 was yet another improvement to his classic adaptation, bearing a true rarity for the time -- an official Star Trek license from Paramount Pictures. Utilities date a lot more quickly than games do -- an old classic game may still be entertaining, but most such tools fall into disuse in the post-hardware emulation era. 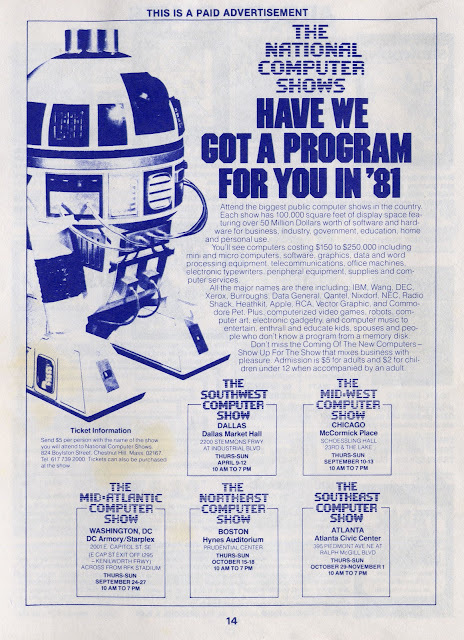 In these modern times when a computer operating system lacking API documentation is commercially non-viable, it's easy to forget that the TRS-80 Model III ROM routines were completely undocumented. 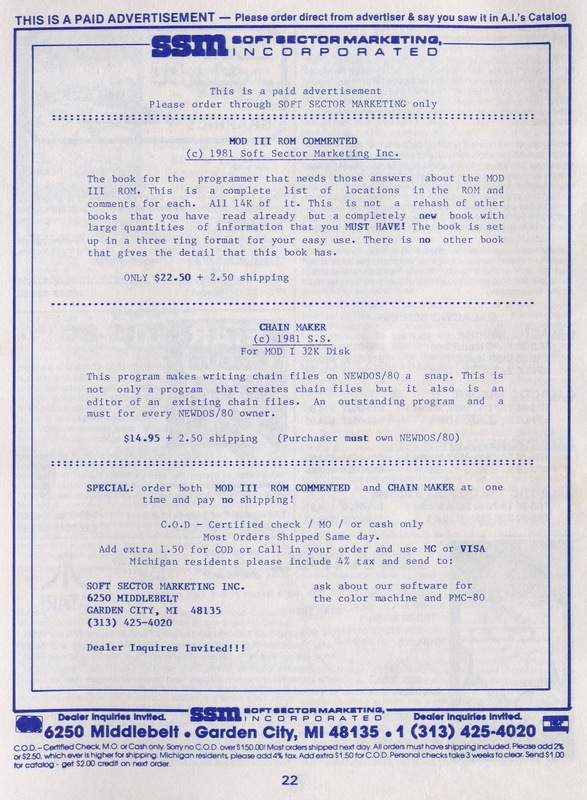 And in the days when every hobbyist needed to know a little bit of programming, $22.50 was a small price to pay for the unofficial but valuable information in SSM's MOD III ROM COMMENTED book. I have no idea what "chain files" were, to be honest -- my guess is they were used to work around inherent file size limitations or compilation/assembly challenges -- but it appears that Chain Maker was a utility for the popular NEWDOS/80 operating system allowing the creation of such, perhaps restoring a missing feature found in Tandy's official TRS-DOS. WiiWare -- One new title this week, called Fish Tank -- and it's actually a match-three puzzle game with an aquatic theme, not just a screensaver as the title implies. I am disappointed that it does not feature icthyoid heroes tooling around in large military vehicles, but at least it's a game. Wii Virtual Console -- Another quiet week. The VC is about as active as that other VC these days. DSiWare -- One new game, Castle Conqueror - Revolution, an interesting real-time strategy/role-playing game hybrid, set in a mythical kingdom with intense battles and player stats. 3DS eShop -- Besides Castle Conqueror - Revolution, the 3DS gets yet another Game Boy-era black-and-white 2-D 8-bit game... a conversion of Double Dragon, with different level designs from both the arcade original and the NES conversion. XBox Live Arcade -- Two new games this week: Bejeweled 3, the latest in PopCap Games' enduring casual match-three puzzle series, and Dungeon Defenders, a colorful action RPG that balances direct combat with tower-defense elements. PS3 on PSN -- A whopping four new games this week: Dungeon Defenders, as above; Telltale Games' second season of canid/lagomorph crime-fighting adventures, Sam & Max: Beyond Time and Space; movie-based robot fighting game Real Steel; and Beat Hazard Ultra, a music-driven shoot-'em-up with psychedelic particle visuals Jeff Minter would love. PSOne Classics -- This platform seems to have revived nicely, with Capcom's classic Street Fighter Alpha 3 hitting the PSN wire this week. I enjoyed playing Anthony Wood's Quest for Fire a few weeks back, and so this week we're going to tackle his 1983 TRS-80 adventure, Space Hunt (no relation to Space Quest, mind you.) This one's billed as A MINI-ADVENTURE and NOT FOR SALE -- but we are encouraged to GIVE A COPY TO YOUR FRIENDS. 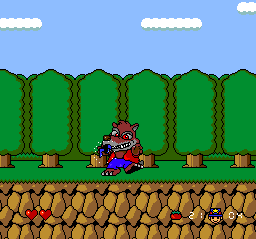 It may have been created as a demo for Wood's MicroAdventure game development system. As a later TRS-80 game, this one does support official and aftermarket upper/lowercase modification kits (those were the days, when having a full set of ASCII characters cost extra! ), though all items are listed in uppercase. 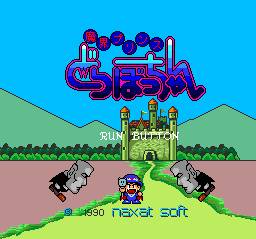 The game is written in speedy machine language and is only about 6K in size, including the game engine and the text. And I need a quick playthrough to keep up with things this week, so this seems like a good choice. We begin in a small room dug into a lunar mountain, with a storage locker and nothing in inventory. There's a first-move death scenario afoot -- if we try to OPEN LOCKER, then Agghhhh!!! I've been fried by 10,000 volts that was wired to the locker! Unlike Wood's Quest for Fire, it seems that during our Space Hunt we will not always be able to see danger coming. An airlock to the east has a red button and an ENTRANCE TO STATION. If we PRESS BUTTON -- without suitable preparations -- then Aggggg.. the air cycles out and I die! At least this death is more predictable. GO ENTRANCE just leads back to the small room, but we have to do this rather than simply going W.
In a small closet to the south we find a space suit, which we learn has a screwdriver in the pocket if we LOOK SUIT. We have to WEAR SUIT, and now we can GO OUTSIDE through the airlock. On the lunar plain is a space ship -- it has a control room, with a control board bearing a small calculator type keyboard -- aka a keypad, before that word became common. We can't TYPE KEYBOARD -- the parser confusedly responds There is not one here! -- or USE anything or START anything. And while we're exploring the limited dictionary, we may discover that READ is actually a synonym for LOOK in this game. The ship's engine room is filled with COMPLICATED EQUIPMENT, with an access panel that's screwed down; we can OPEN PANEL with the screwdriver to find a blaster. (And if we don't have the screwdriver, the game helpfully tells us You are not carrying a screw driver. So we won't need to improvise a tool here.) We are, of course, immediately tempted to SHOOT BLASTER, which in the present location yields I don't see anything to shoot here! We can't shoot the locker either, but with the space suit on, we can OPEN LOCKER -- NASA would be impressed by a space suit that can absorb ten thousand volts. Inside the locker is a scrap of paper, and READ PAPER yields 3215. Now we can return to the space ship and TYPE 3215 (not TYPE KEYBOARD) and launch the spaceship, landing in a few hours on a small asteroid. This explains why the game file is titled ASTEROID.CMD, rather than SPACHUNT.CMD or something, and exiting the ship allows us to explore the giant rock's pitted surface. There's not much to do here -- we're pretty close to the end of the game -- but there's amusing historical relic -- in this small crater, A sign says: Leave any comments to Anthony Wood on Houston or College Station BBS's. That's how it was done before the Internet age, and it indicates that Mr. Wood was based in Texas. There's not much else to look at on the asteroid, beyond a big boulder. But if we do the obvious and SHOOT BOULDER, then The boulder blows up! Oh nooo... I'm hit by a piece of flying rock. I'm too big of a target! Agggggghhh... So there is another puzzle to deal with here. If we LOOK BOULDER, the game notes that There seems to be somthing [sic] under it... But ROLL BOULDER establishes that it's too heavy, and the dictionary won't let us DIG anywhere. So what should we do here? We can't DROP SUIT to reduce our size -- Aggghhhh! I can't breath!! [sic] But we can LIE DOWN to make ourselves a smaller target, and now The boulder disintigrates [sic] nicely. Down the tunnel formerly concealed by the boulder, we find the treasure room which contains, in uncharacteristically undescriptive fashion, MUCHO CREDITS WORTH OF VALUABLE STUFF. We can't learn anything new by examining the treasures, but if we GET STUFF then... rather unexpectedly and abruptly... victory is ours! I was expecting that we would at least have to get the treasure onto the space ship and return to the station, but apparently finding these goodies is sufficient to call it a successful voyage. That was fun, and fit my schedule this week nicely. Mr. Wood's remaining games appear to be more substantial, and we'll tackle them in due course. 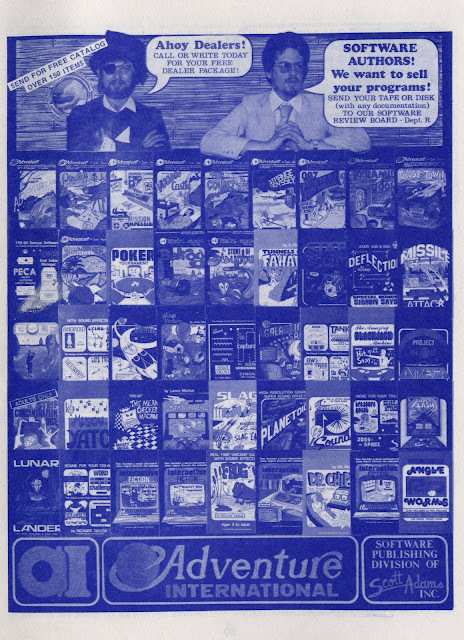 We're looking at two more pages from the substantial Adventure International catalog, marketing Scott Adams' classic adventures as well as a number of other products in the early days of home computer gaming circa Spring 1981. I always wanted to see this ad in full color, because it captures Peppy's original cover art for many of these vintage products -- I suspect it was run in that format in magazines but I haven't run across it. 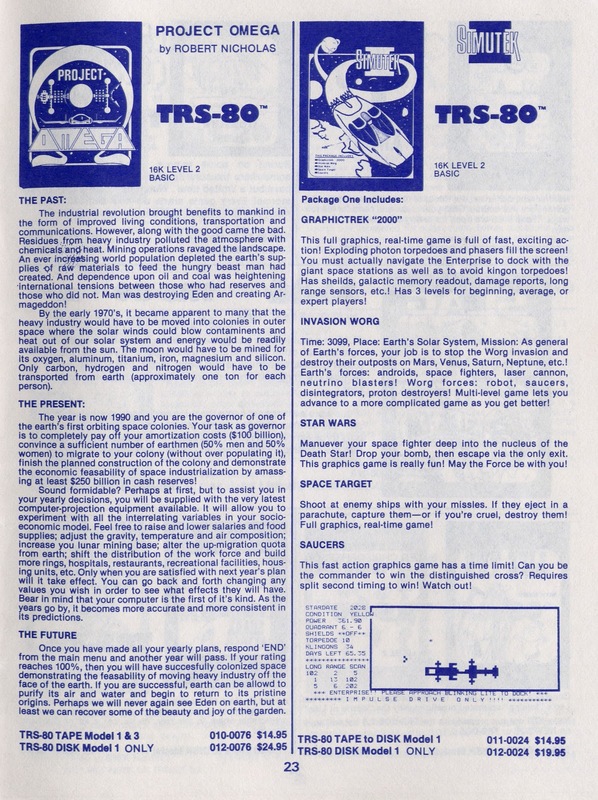 The package consists of three separate experiences -- Galactic Empire, Galactic Trader and Galactic Revolution -- and was created by one Doug Carlston, who with his brother Gary would later found the software publishing powerhouse Brøderbund Software. Later Adventure International catalogs credit the game to Brøderbund instead of Carlston personally, and Wikipedia lists Galactic Empire as the company's first product, but at least in its very early days this burgeoning giant relied on another company for distribution. More to come in the not-too-far-off future! 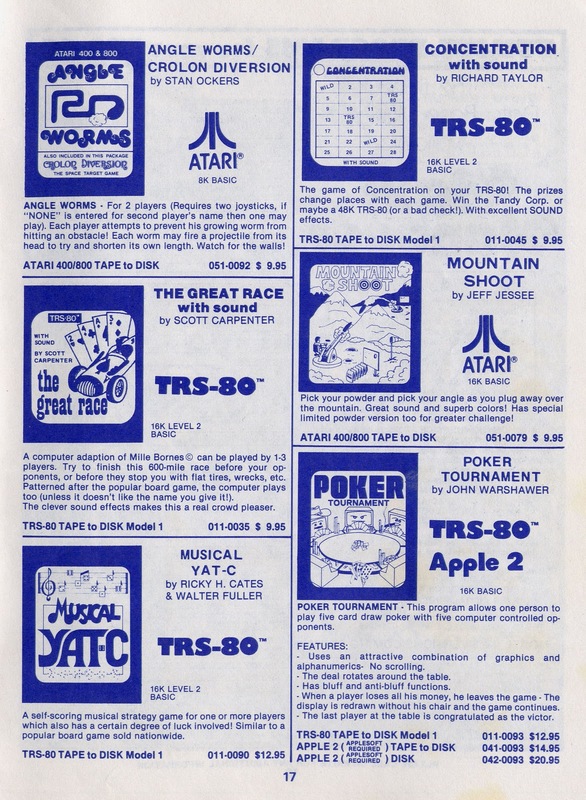 As we continue our nostalgic trip through the Spring 1981 Adventure International catalog, we encounter a number of long-forgotten products, but many of them have well-known descendants active in today's market. Stan Ockers' Angle Worms / Crolon Diversion features the early competitive line-building game best known today from the movie TRON's light cycle sequence, as well as a space target game of some kind that the catalog copy can't be bothered to describe. Richard Taylor's Concentration is a version of the popular image-matching game -- somehow none of the computer game publishers were ever sued by the game show's producers, even though most of them appeared under the name Concentration; there may just have been too many to sue, as this is actually the second such game in the Scott Adams catalog, if we count the one packaged with Kid-Venture #2. Scott Carpenter's The Great Race adapts the traditional card game Mille Bornes, John Warshawer's Poker Tournament is a player-vs.-CPU game of poker, and Musical Yat-C by Ricky H. Cates and Walter Fuller adds music and a trademark-skirting name change to the popular game of Yahtzee. Jeff Jessee's Mountain Shoot puts two opposing cannons on a randomly-generated landscape, using another early competitive game concept that eventually evolved into the long-running Worms series. 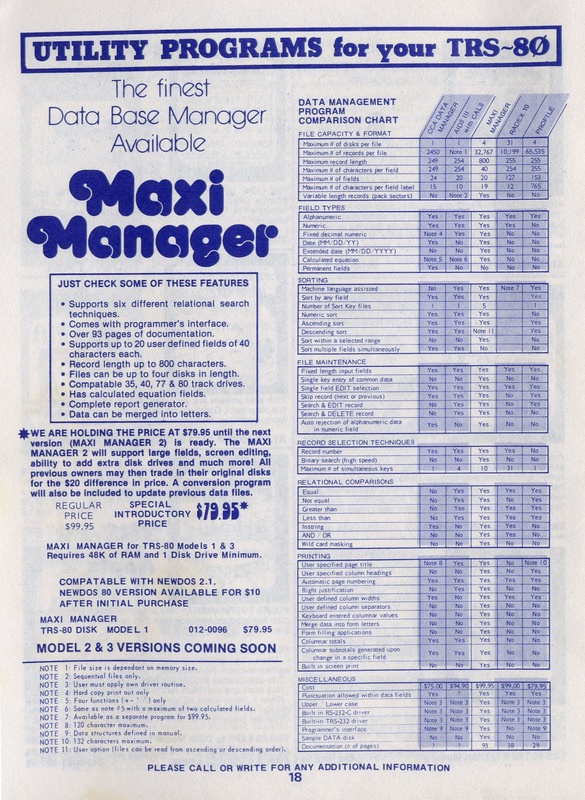 The system's capabilities aren't bad at all considering the hardware and diskette space available at the time -- while today's databases handily deal with millions of records of arbitrary size, this system was probably powerful enough to serve its customers well back in the day. 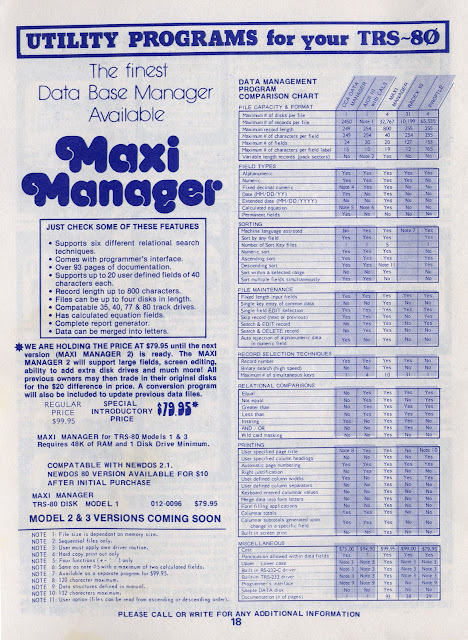 The feature comparison table is interesting -- all of the products listed are long gone, but either Maxi Manager was significantly ahead of the pack or the competition was carefully cherry-picked. And I imagine the makers of AIDS III were rather relieved to be out of business in the mid-1980s. CAL seems to be an acronym. 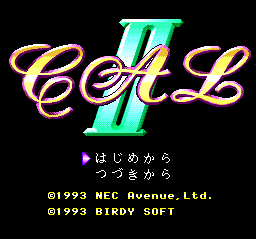 I don't know for sure that there ever was a CAL I -- only CAL II and CAL III made it to the PC Engine, at any rate, so while there was almost certainly a predecessor, my best guess is it was on the MSX or another Japanese home computer platform. And unlike most of the PCE digital comics I have written about here, it's not based on any anime property with which Western gamers are likely to be familiar. So we're just going to have to take this one at face value. There aren't very many choices to make between the lengthy dialogue sequences -- sometimes only one. And some of the responses have no real bearing on the story, such as a sequence in which our hero is quizzed about his blood type. But my real problem here is that, given my extremely limited Japanese language skills, for me the interactive bits become yet another exercise in selecting options at random until something breaks through and allows some progress. I assume our hero's ultimate goal is to get back home, but with little clue about the story's development, the quest grows tiresome before the end is in sight. 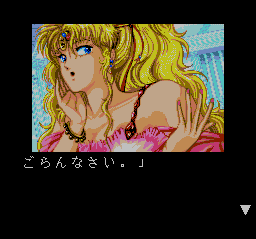 The production values of CAL II aren't bad -- the artwork is colorful and detailed, using one of the PC Engine's higher-resolution graphics modes, and sometimes there's a little bit of incidental animation to liven up the still images. 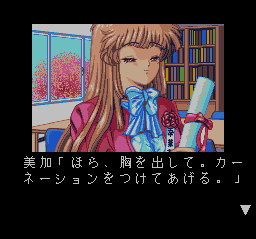 All of the lengthy cutscenes and some of the interactive dialogue sequences are voiced, though CD-ROM space was limited and thus every spoken line suffers from the scratchiness common to digitized audio on the PCE. 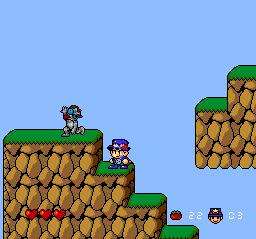 Background music is played using the PCE sound chip, sacrificing something in quality for the sake of continuity during frequent disc access. At this point I wasn't motivated to revisit the story and try to make better choices, so that's about all I have to say about CAL II. I will probably tackle CAL III sometime soon, just to get it out of my queue... but I'll forewarn you that it's pretty much more of the same. WiiWare -- One new game this week, with the K-Tel-esque title 101-in-1 Explosive Megamix. 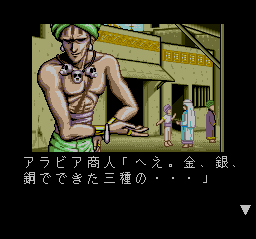 It's a collection of minigames, of course, but the 2-D graphics aren't bad. There's also a free demo version of FAST: Racing League. Wii Virtual Console -- Nothing here again this week. Going once? DSiWare -- Two new games. The WiiWare physics-based platformer Furry Legends also comes to the DSi, along with 1001 Blockbusters, a Breakout-style game using the DS stylus for paddle control. 3DS eShop -- In addition to the DSiWare titles, the 3DS gets another old, unenhanced Game Boy title -- it's Nintendo's own Catrap, a 100-level maze/puzzle game with a handy rewind feature. XBox Live Arcade -- Two new titles on the wire. Real Steel is a mech fighting game based on the new Hugh Jackman movie, which was filmed in my part of the world and features a number of my theatrically-inclined friends as extras. 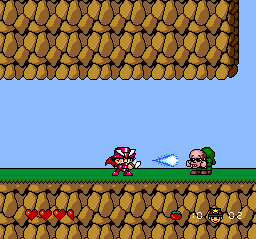 Guardian Heroes is a scrolling beat-'em-up that made quite a splash on the Sega Saturn in the mid-90s, developed by the magicians at Treasure and now ported to XBLA, in widescreen with a choice of original or "remixed" (filtered) HD graphics. PS3 on PSN -- Just one new game this week -- Sideway: New York, an extremely stylish platformer set in the gritty world of New York... art! PSOne Classics -- I've got to find a more consistent source for this information. 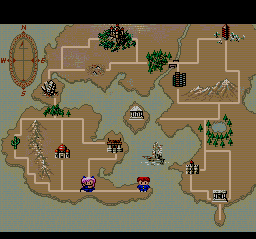 I didn't think anything came out last week, but it appears that Square-Enix's Super NES classic RPG Chrono Trigger has made it to yet another platform as of last week. And this week sees the considerably less exciting easily avoidable XS Junior League Football. 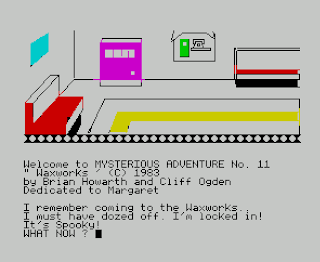 I've been slowly working my way through Brian Howarth's Mysterious Adventures, created in the U.K. using the venerable Scott Adams engine, and this week we're looking at the series' final game, Mysterious Adventure #11: Waxworks, co-authored with Cliff Ogden and published in 1983. 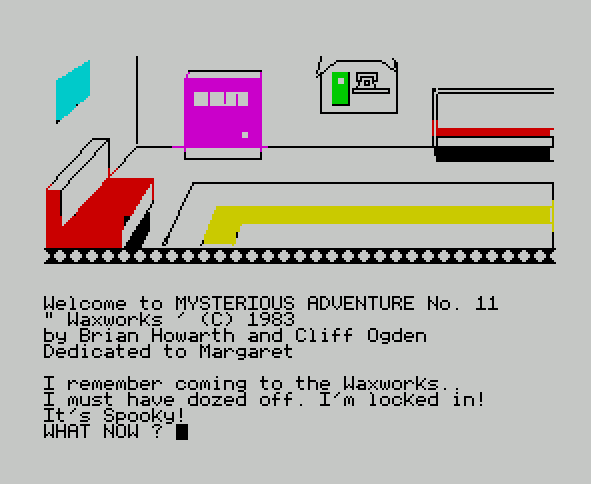 It's a classically simple adventure game plot -- the player wakes up trapped in a wax museum, and must try to escape the building while solving puzzles of a humorous and ostensibly creepy nature. I played the modern Inform port of the original game to solve it, then took a second run through the Spectrum version to capture some more visually interesting screenshots. The problem with the illustrated versions is that new items are frequently announced with I can see something!, and we have to switch from graphics mode to the textual room description to see exactly what something is. The game opens in a Leisure Lounge, where the player has been locked in after dozing off unexpectedly while visiting the titular Waxworks. We see an old-fashioned slot machine, a public telephone, a wooden beam (which we can conveniently carry) and a few seats. USE TELEPHONE reveals that, unfortunately, It's been Vandalized! so it's not likely to be of any use, but EXAMINE PHONE turns up a coin. The Slot Machine reportedly gives Prizes, and INSERT COIN (not PLAY MACHINE) yields a Flashlight, though INVENTORY subsequently calls it a Small Torch, in the British vernacular, which confused my American eyes for a moment. (Actually, this varies from version to version -- the Spectrum ZX version calls it a Flashlight.) We also get the coin back. EXAMINE SEATS turns up a key, so our initial explorations are well-rewarded with traditional adventure accoutrements. We are also carrying a piece of paper and a box of matches as the story begins; the paper is simply an advertisement for the Mysterious Adventures series and its then-current publisher: "It says 'See your Local Dealer For All the MYSTERIOUS ADVENTURES or Contact DIGITAL FANTASIA'" This was another Scott Adams tradition adopted by Howarth and many other early adventure game authors, and I always feel like I've found a tiny treasure when I run across these mini-promotions -- after all, why would you not try to sell directly to your self-selected target audience? The Waxworks is, of course, an operating wax museum closed for the night, so there's a Grand Hall with a couple of exhibits, where we learn that solving the puzzles here is going to require a little independent research, certainly a more time-consuming process in the pre-Google era. The Ascend Everest display features wax figures of Edmund Hillary and Tensing, and a voice demands that we Say the year it happened. SAY 1953 yields Correct!, while SAY 1946 yields I don't know what a "1946" is, so the quiz's parsing mechanism leaves something to be desired. The nearby Undersea World display features Jacques Cousteau in scuba gear, and presents an algebra problem completely unrelated to the theme -- When I was 31 my son was 8 I am now double his age 'Say' how old I am. SAY 46 is Correct! Getting both answers right doesn't appear to immediately change anything, but these events do produce related results elsewhere in the game. The Hall of Mirrors is, as one might expect and dread, a maze that must be mapped out the old-fashioned way, by dropping items so we can figure out where we actually are, as most of the six rooms look exactly the same. If we're successful, we find a dead-end room containing an Aqualung, which we should probably take with us on general principle. There are also two exits from the maze -- one emerges near an Airlock, the other goes into a Dark Passage with a Narrow crack in wall. And we can't go back to the Leisure Lounge once we've entered the maze, so we need to escape via one of these two routes. GET AQUALUNG and GO AIRLOCK yields That was STUPID! I've drowned, as we find ourselves in a large aquarium tank with Jaws IV lurking in the water; maybe drowning isn't the worst way to go after all. We need to WEAR AQUALUNG, which allows us to paddle in circles while the shark draws nearer, and actively SWIM to emerge by another airlock. From here we can get to the Maintenance Workshop, the Store Room and the Modeller's Studio, where we find a pile of junk and can SEARCH JUNK (twice) to come up with an old lamp and a crowbar, both of which tick standard adventure game boxes. But we can't seem to LIGHT LAMP, and we can only carry six items, so the torch may have to do. There's a loose trapdoor in the Store Room's roof, but I wasn't able to find a way to open it; as it turns out, that's not what we're supposed to do with it. (On my second playthrough, you can see that I arrived here by a different route.) A sign here reads No Waiting, and WAIT plunges us into darkness, so I initially concluded that we should just respect the signage. Actually, the wait takes us to another room where we can use the torch, but exploring elsewhere in the area, we find a tree house that contains a cupboard with an (inedible wax) Apple and a gold key in its lock, and going U from here takes us back to the Grand Hall -- one way, without any of the items we collected earlier due to the narrow crack. There's a washroom north of the Leisure Hall, and a Jacket we find via EXAMINE TOILET (it's hanging behind the door, mind you.) The Jacket contains a pistol and three silver bullets, so apparently we will be encountering a werewolf at some point, or else the jacket's owner suffers from a very unusual bathroom phobia. We can LOAD GUN to put the bullets in the gun and thus conserve an inventory slot. There's also a locked grid in the bathroom, and the gold key does nothing interesting with it. We need the small key from the Leisure Lounge to open the grid, and the torch to light our way once we go down there. The Old Sewer is another maze. One room has some sewer rats, another a Humane Rat Trap. So this solution seems fairly obvious -- EXAMINE TRAP yields a convenient piece of cheese, though baiting the trap is a bit of a parser challenge. FEED RATS simply allows them to eat the cheese. We can't SET TRAP or BAIT TRAP or INSERT CHEESE or USE TRAP or GET RATS. I finally referenced jgunness' classic solution at his CASA Solution Archive site to learn that we don't actually need to trap the rats, we just want the cheese for the moment. So we can navigate back to the Wash Room to exit the maze, though we can't go out the same way we came in. 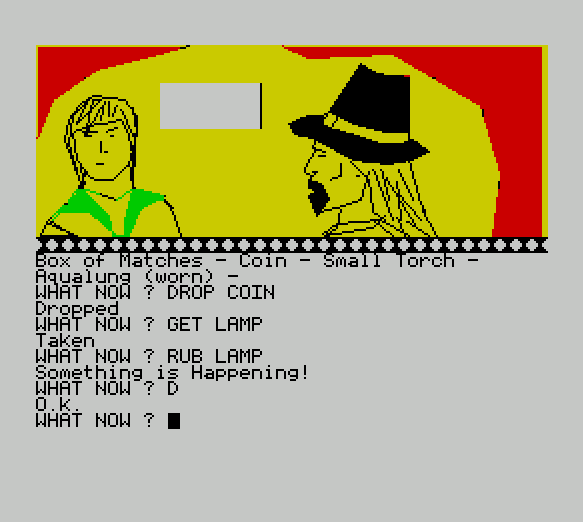 I was starting to run out of ideas, and the walkthrough informed me that we do need to rub the Old Lamp in the Store Room -- I had tried to do so earlier, given established adventure game traditions, but was told I can't do that yet. It emerged that we just have to GET LAMP first, which I should have realized, and this action magically whisks us to Aladdin's Cave, naturally. From here we can go D to reach the Enchanted Woodland with our inventory intact, bypassing the narrow crack. What next? Well, I was on the wrong track -- we don't need to pry open the trapdoor with the crowbar, we need to FIX TRAPDOOR using the wooden beam. We can't carry the beam through the airlock -- Beam is too long! -- but the lamp remembers where we came from, so we can take the beam to Aladdin's Cave, go back to the Store Room, and travel back and forth to reclaim the beam. Now we can secure the trapdoor and go to the Enchanted Forest and WAIT again, this time turning on the flashlight so we can discover we've arrived at a Rustic Well. Walkthroughs can be confusing, because they don't always tell us why we're doing what we're doing. So I backtracked to see if securing the trapdoor had anything to do with reaching the Well -- it doesn't, but I discovered in the process that if we haven't solved the riddles of the Grand Hall exhibits, the Aqualung does not appear in the Hall of Mirrors. And, similarly, if we didn't solve the Everest riddle, the Climber's Rope does not appear near the Well, and GO WELL yields It's too Risky! The Pendulum will kill us in a mere three moves, so we need to DROP CHEESE to get the rats to chew through the ropes tying us down and free us in the nick of time. The pendulum embeds itself in the Altar to which we were tied, and EXAMINE ALTAR reveals a Talisman. We can go up to a Pit (where there's a Pendulum...) and reach the Execution Chamber. Now we can see why fixing the trapdoor was important -- there's a door beyond the trapdoor which we could not otherwise reach. Beyond the Execution Chamber is an incongruously placed Jewellry [sic] Exhibition, where we must EXAMINE JEWELLRY to find a Golden Casket, apparently not large enough to notice without closer examination. It can be opened with the Gold Key found in the treehouse earlier, to reveal some Tanna Leaves. So we will probably be dealing with a mummy at some point. Beyond the zombie lies a passage blocked with masonry. I needed to reference the walkthrough to find out that the Guy Fawkes figure in the enchanted woodland can be MOVEd to find a small barrel, presumably an explosive device given Mr. Fawkes' historical significance. It has a fuse, but LIGHT FUSE doesn't work until we first LIGHT MATCH. And we have to be carrying the barrel at the moment, once it's on the ground we can't light the fuse. I burned a few matches getting this combination right -- finally, after we light the fuse, drop the barrel and run to the west... B O O M There's an Explosion! This wax museum's prop department seems more dedicated to realism than would normally be expected. Now we can pick our way through the dust and debris and GO PASSAGE to reach... an Egyptian Temple? Oh, right, we're in a wax museum, so it's an ersatz Egyptian display. But the sarcophagus here, once opened with the crowbar, reveals a Sinister looking mummy! It's not mobile, at least until we GIVE TANNA, at which point it revives and Says 'Unbeliever!' and then Strangles me! Dang these religious fanatics -- although, to be fair, I should acknowledge that in this case it's me knocking on its door, or rather breaking it open with a crowbar, and it was probably more deeply asleep than the normal victims of door-to-door evangelists. Anyway, we have to first WEAR TALISMAN (though close examination reveals no clues about its purpose) to receive a golden mask instead of swift death. Now we can WEAR MASK to learn that... very abruptly, the game is over! We are told only that I've been asleep. It was all a Dream! But what an ADVENTURE it was! Thank Goodness I've Survived! -- which may be a euphemism for The Designer is Out of Ideas and/or the Database is Out of Space. 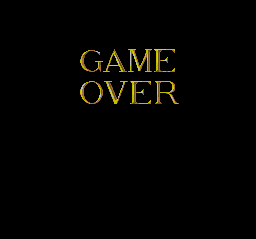 But it's an ending, albeit a rather unsatisfying one. There are a few more Brian Howarth adventures remaining -- while the Mysterious Adventures series ended with this eleventh game, Howarth wrote several more games under standalone titles, and we'll likely tackle them in due course. 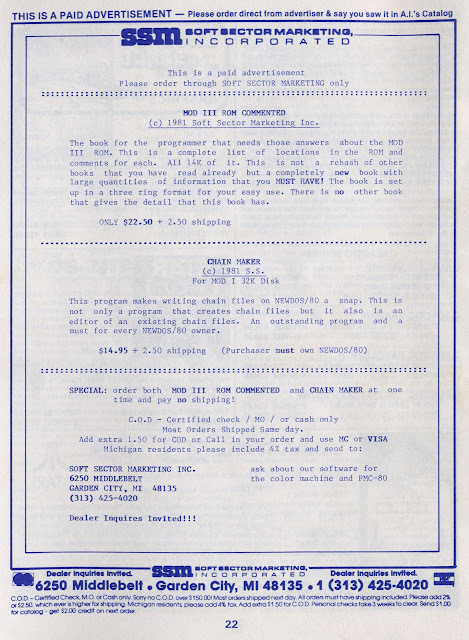 More from the pages -- actually, literally the pages, 15 and 16, of the Spring 1981 Adventure International catalog. Lance Micklus' The Mean Checkers Machine 2.0 is a machine-language update of his checkers game originally published in BASIC-language magazine format. Note that the packaging gets the name right but the catalog logo calls it The Mean Checker Machine, which leads me to imagine the self-checkout machines at the grocery store with more attitude than usual: "I said, put the item in the bagging area! Idiot!!!" For some reason, Scott Adams has chosen to offer competition to his own discount-priced Backgammon program with Back-40 III. 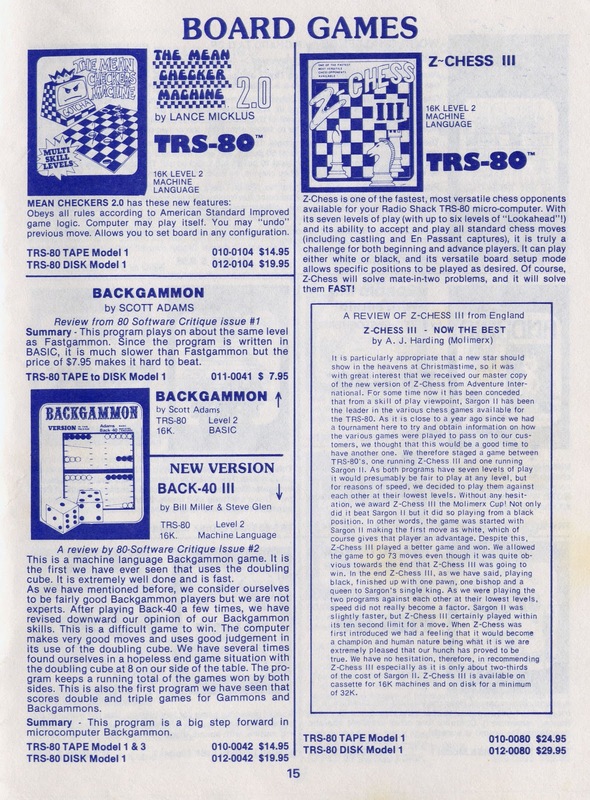 The game of backgammon presented some AI challenges, apparently, as the newer program was billed as "the first we have ever seen that uses the doubling cube." I don't think I've ever played a game of computer 'gammon that didn't support doubling. 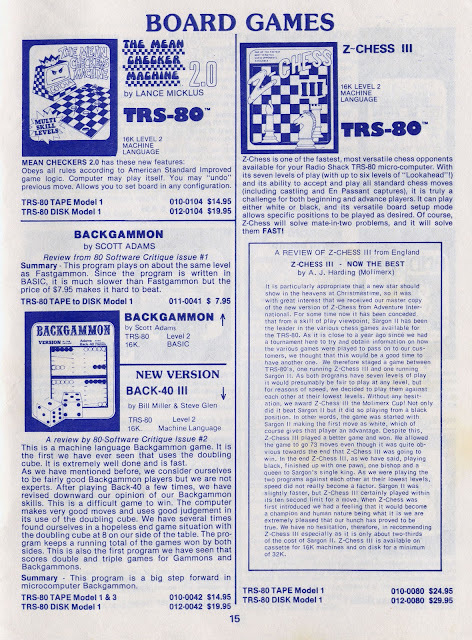 And Z-Chess III was a chess program, no mean feat on the humble TRS-80; note that the review included here is by one A.J. Harding at Molimerx, a company that published quite a few computer games in the UK including the Brian Howarth adventures based on the Scott Adams database format. 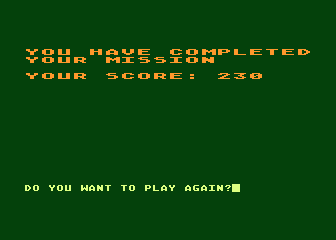 The most notable title here is Leo Christopherson's Android Nim -- Christopherson pulled off some amazing character animation on the TRS-80, including the later Dancing Demon, and in 2005 he updated this particular game for modern PC's, as Android Nim 2D. 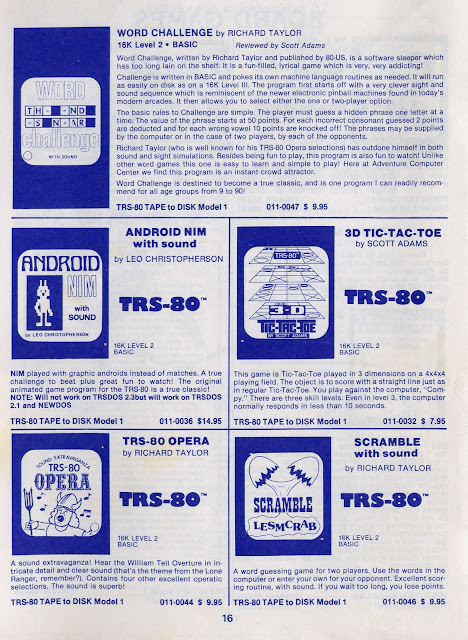 Most of the other titles here are staple early computer game offerings -- simple word games Word Challenge and Scramble, both by Richard Taylor, and Scott Adams' own take on 3-D Tic Tac Toe. I was always intrigued about Taylor's TRS-80 Opera, but never anted up the $9.95 for it; this wasn't a game, but a music-playing program from the era before the Commodore 64 made computer music listenable, and long before the advent of iTunes and MP3 files. Next weekend (if things go as planned) we will continue our nostalgic journey, and I'll get back to a more regular schedule! 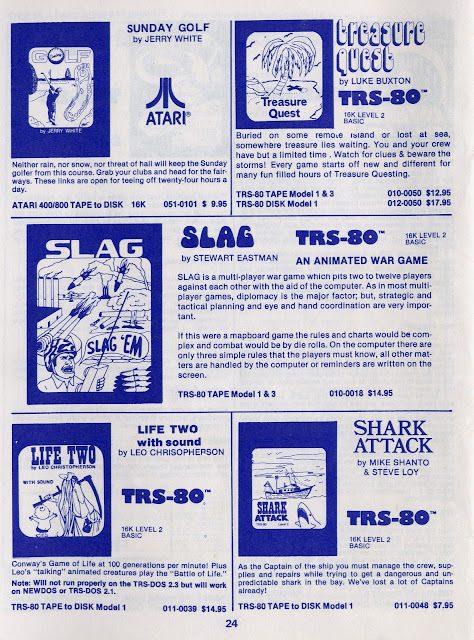 It's time once again to resume our regular (though frequently interrupted of late) page-through of a vintage computer game catalog. From way back in Spring of 1981, it's Scott Adams' Adventure International catalog, pages 13 and 14! 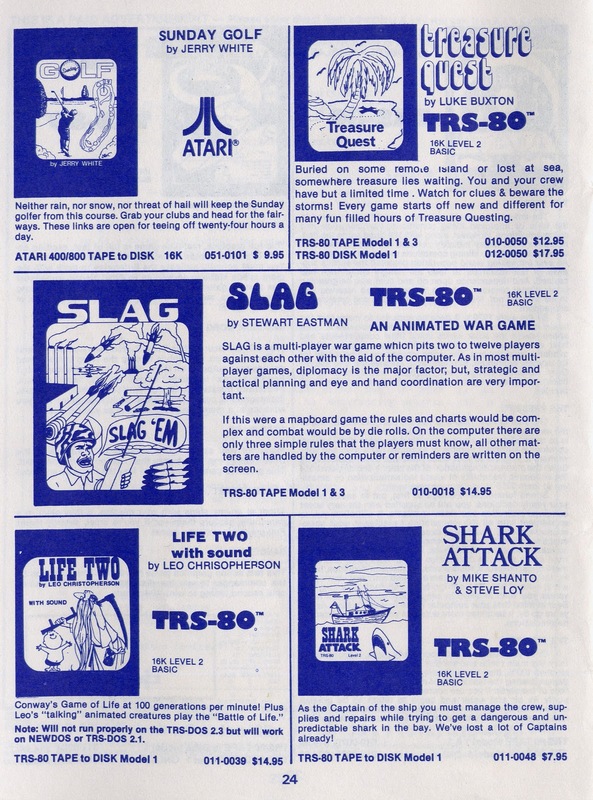 As was common at the time, most of these are unlicensed versions of popular coin-op arcade games. Showdown is (ahem) "similar to the gun fighting arcade game", that is, the Taito/Midway Gun Fight and Boot Hill games; Space Colony is "in the space invaders theme." Note that the Color Computer version, crammed into 4K, was written by Charles Forsythe, who did a lot of impressive work for The Programmers' Guild. I've written at some length about the mummy-themed maze game clone Tunnels of Fahad earlier. Silver Flash Pinball was presumably semi-original, and was developed by a company called Southern Cross Systems -- it appears they're still around, though they morphed into a digital imaging company circa 1984. 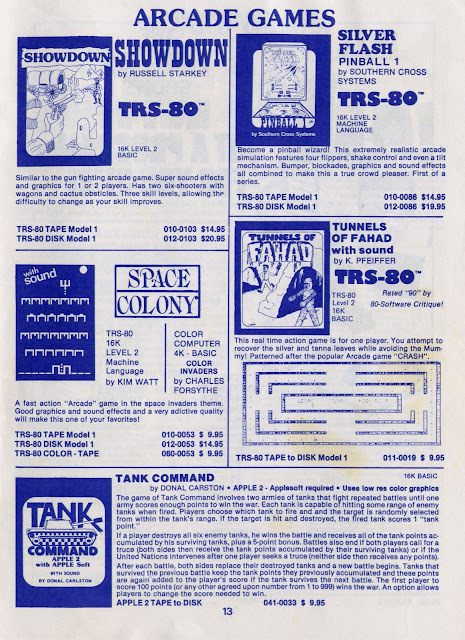 And Tank Command appears to be an early version of the player vs. player combat contests that remain popular today. I'm not at all familiar with these events, and a quick Google search doesn't turn up any interesting history; the National Computer Shows promotional organization was still advertising in InfoWorld magazine circa 1982, but as far as I can see the company seems to have faded into history not long after that. WiiWare -- In an unusual (for the Wii) twist mimicking the XBLA approach, the platform sees Horizon Riders and a free limited demo of Horizon Riders. It's a racing game featuring hoverboard riders, and works with the Wii Balance Board -- nice to see the trusty old Wii Fit peripheral getting some support. Wii Virtual Console -- Nothing here this week; again, Nintendo's retro-gaming focus seems to be all about the DS lately. DSiWare -- Two new titles this week, which is fairly quiet by DSiWare standards. House M.D. -- Skull & Bones is the third investigative medical adventure for the DSi and 3DS, featuring the characters from the popular TV series. Simply Minesweeper is, simply, Minesweeper. 3DS eShop -- In addition to the DSiWare game, the 3DS gets a virtual Game Boy release with Data East's 8-bit pool game Side Pocket, originally seen on the NES. There's also a free Pokedex 3D update with new information about everyone's favorite pocket monsters. XBox Live Arcade -- Four new titles this week. For a change, XBLA and PSN seem to be largely in synch, with Sega Bass Fishing, Space Channel 5: Part 2 and NBA Jam: On Fire Edition hitting both platforms at the same time; see details below. The fourth XBLA titles is Orcs Must Die! -- it's an action game with tower-defense elements, as the player sets up traps to stop the invading orc hordes. PS3 on PSN -- Four new titles this week. Two Dreamcast ports from Sega -- Sega Bass Fishing, which hasn't aged all that well, and Space Channel 5: Part 2, the rareish sequel to Ulala's first rhythm/dance adventure, which improves the visuals with real-time 3-D backgrounds instead of pre-rendered video footage. NBA Jam: On Fire Edition continues the recent revival of Midway's classic arcade basketball game series with some new features including improved AI. Eufloria is an interesting fractal-based action/puzzle game based on a concept by physicist Freeman Dyson, challenging the player to grow and spread trees across randomly-generated asteroids. PSOne Classics -- Nothing new here this week. 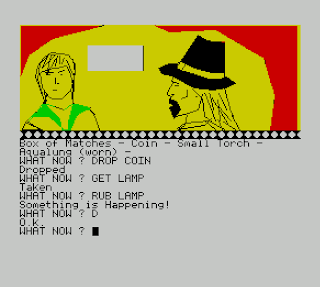 I've been on a bit of a SoftSide text adventure kick lately, and this week I'm filling in another gap in my recent play history by tackling the monthly disk magazine's Adventure #6: Around the World Adventure, published in November 1981. I'm playing the Atari 400/800 version here. Perhaps it's not so much the dialogue attributed to YOU as the blandness of our response that I find annoying; "Yes I will," we say, which hardly seems necessary under the circumstances, and a simple YES/NO answer could have been handled by the parser. We have 80 days to make the trip, and one of our first discoveries is that they pass very quickly -- in addition to fixed increments associated with travel by various conveyances, we seem to burn a day every ten moves or so. This approach has the odd effect of squeezing and dilating time -- it takes us a good day to make our way up the street to the haberdashery and buy an overcoat in London, for example, while it takes less than a week to cross the continental United States by handcar later on. 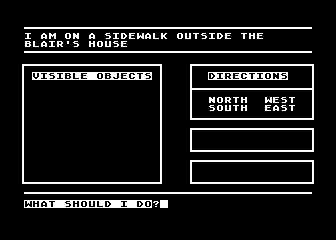 The game uses an engine similar to other SoftSide games -- this one adds a handy location line at the top of each room description so we can keep track of our whereabouts. We are in London England at the start of the game. An empty inventory just says You are carrying: with no clever text to cover the void. And there are no EXAMINE or SEARCH verbs, so our interactions are pretty much limited to getting, dropping, and going places. The game's structure is interesting and clearly constrained by memory and development time -- because there are so many locations to cover, each part of the world consists of a handful of rooms and one or two simple puzzles. The London street where we begin our journey features a water puddle and a lady in distress, so presumably we need to make like Sir Walter Raleigh. And indeed, we can GET OVERCOAT at the haberdashery to the north, then DROP OVERCOAT, whereupon Lady thanks you and crosses coat -- to no apparent effect? Ah -- if we do not do this, she yells, "Stop! Balloon thief!" and won't let us get into the hot air balloon parked conveniently in a vacant lot to the east. So either the balloon belongs to her, or we're just silencing a potential tattletale with our gallantry; it's never made clear. There's a port to the west, but no ships are available as the game begins. The balloon contains 4 bags of ballast, and DROP BALLAST unloads one bag at a time until we take off. We drift along briefly until a pelican pecks the balloon, and suddenly we find ourselves in Barcelona, Spain with a wrecked balloon and a dead pelican. 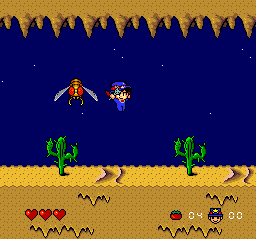 There's a magnifying glass on the nearby beach, and a desert to explore, though there's no DIG verb so we won't be doing any treasure hunting. What we need to do here is encounter a starving man in the desert -- GIVE PELICAN doesn't do him any good, but with the magnifying glass we can DROP and then COOK PELICAN. Now the starving man says, "You may use my yacht," which makes his current predicament rather strange as the yacht is docked just a bit to the west. But we're only too happy to take his yacht to Marseille, France, where we will leave it for him to pick up at some later date, if he doesn't starve to death after the pelican runs out. I supposed we really haven't time to teach a man to pelican, though. In France, some knife-wielding French punks chase us away from the train station. They're strangely reluctant to actually do anything to us, it seems, as they never quite catch up to us -- even if we WAIT and a day passes, we still see that Oh! Oh! Punks are chasing you! We need to borrow an old Hanna-Barbera gag and turn a detour sign pointing west to make it a DETOUR SIGN SOUTH, leading to a cliff; eventually, after more chasing, we learn that Punks take your bait and tumble down the cliff. Once we're in the station, we learn that the train leaves in 14 hours -- but we can WAIT as many days as we like and it still won't go anywhere. We need to grab a ladder and change the time on the station's LARGE OPEN-FACE CLOCK to fake the official timetable, and now we're off to Brindisti, Italy. In Italy, a mouse scampers by in the street and a fat lady blocks our path in an alley. We can get a piece of cheese in the food store, and then DROP CHEESE in the alley, attracting the mouse and scaring the lady off. We find a steamship at the Italian port to the north, which takes us to Bombay, India. In Bombay (now Mumbai -- one of those cases where a 1980s adventure game's real-world references are already dated), there's an unused shovel at hand, and workmen block the way east. An ungrammatical and Mad indian native throws spear at you but missed in front of the Taj Mahal. The spear is now impaled in the fence (I don't think impaled is really the right word here) but we can just take it. We can also enter the Taj Mahal, where we find a long rope in the temple. And, given the items at hand, it suggests that we can TIE ROPE (which attaches it to the spear). There's an upstairs room with a steel post and an open window, but we can't JUMP WINDOW or GO WINDOW or THROW SPEAR. And we can't THROW SHOVEL, either; all of these attempts yield the maddeningly standard You can't do that now. Hmmmm. Well, we can also TIE ROPE in the Taj's upper room so that we end up with a ROPE TIED TO POST; but if we have already tried to TIE ROPE with the spear in inventory it ties it to the spear and apparently can't be untied. And even with it connected to the post, we still can't seem to do anything with it. We can't TIE ROPE to the spear while it's impaled in the fence, so we can't use it to pull the fence down. If we tie it to the post, then the spear, we end up with the rope tied to both, i.e. ROPE TIED TO POST and ROPE TIED TO SPEAR both in inventory. But we still can't seem to throw the spear out the open window, which seems the obvious thing to do. So, guessing that I was on the right track but couldn't convince the game to understand my intentions, I took a peek at the code to confirm that we can slide down the rope if we're in area 35 (the Taj's upper room) and have a particular state variable RP set to a value of 4. Examination of the evolution of RP indicates that we have to do this in a very specific way. We have to first TIE ROPE (to spear), then TIE POST second, and then THROW SPEAR. Now, finally, we can GO ROPE to slide down it past the workmen and get to the train station, where it develops that we have more to do here than elsewhere. This train is more detailed, but apparently understaffed, and we can buy peanuts from the peanut vendor in the passenger car. We must also use the shovel to stoke the tender and open the throttle in the locomotive. This takes us to the end of the tracks, in a jungle, where once again we must abandon our previous mode of transportation. Apparently the transformation from DETOUR SIGN POINTING WEST to DETOUR SIGN POINTING SOUTH back in France was a little buggy -- the engine puts the former version of the sign in the player's inventory, but this object doesn't properly exist in the game and so causes problems if we try to manipulate it later on. Going east through the jungle (north/south directions just come back to the main east-west strip), we find the expected elephant in the elephant pasture. If we forgot to buy peanuts, fortunately, the peanut vendor is still happily peddling his wares in the passenger car where we left the train. We need to GIVE PEANUTS, and then the Elephant eats nuts and lets you mount him. Um. This is one of those situations where a few more bytes of text would have gone a long way toward creating the intended picture in the reader's mind. Anyway, we will execute quite a few cycles of GO ELEPHANT and RIDE ELEPHANT as we explore a cultural mishmash, where an Indian princess (presumably not Native American) is surrounded by fire, to be sacrificed in the jungle by a dozen natives in the sort of ritual uncommon to India, even in old movie serials. A lake to the east is useful -- the elephant can fill its trunk there, and then use the water to put out the fire, largely of its own accord with no real prodding from the player aside from repeatedly riding him where he wants to go. We can't leave the ritual site after rescuing the princess, or do much else, until we GET PRINCESS and resume our travels with her awkwardly stashed in our inventory. Beyond that, the only useful thing to do is to ride the elephant again.... all the way to Ahmadabad. In Ahmadabad, a sign in front of the train station reads, "Leave elephant here." If we fail to do so, we end up stuck in jail, although at least the authorities allow us to keep the Indian princess for company. If we park our dangerous nut-eating elephant properly, then the next train gets us to Calcutta, and in the port we need to JUMP to just barely make it onboard a departing steamship. After some ocean travel, we're in San Francisco -- these areas get smaller and simpler as we go, probably because memory was running low or the author needed to wrap up the game, so we're rapidly funneled across the Golden Gate Bridge, then by train to a valley where Tinkerbell is seen flying by (in what I presume is a departure from Verne's original narrative) and the bridge is out. 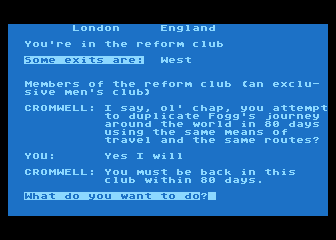 Despite her patient endurance and contribution to the journey, if we take the steamship from New York to London and return to the Reform Club with the Indian princess in inventory, our rather snotty "friend" Cromwell simply says, "Sorry, no admittance!" -- as it's an exclusively male club. On my first try I came in at 82 days and I thought he was refusing me entry because I was late, but the princess turns out to be the real issue here. Why we are still trying to please these misogynistic and probably colonialist club members after our perspective-broadening adventures is now a mystery. But if we've made the journey in 79 days or less (gaining a day by crossing the international date line), we receive an acknowledgment that we bettered Mr. Fogg's time; in either case the game is over and we have been successful. Around the World is a fairly quick and pleasant play; aside from the Indian rope trick difficulties with the design, all of the puzzles are easy to solve, and aside from getting stuck in jail there are no fatal scenarios that I could discover, just the pressure of the ticking clock. It's one of those games where we have to figure out how to solve it, then do it again as efficiently as possible, but it's not overly demanding once we know what we're doing. My walkthrough below the fold (also available at the CASA Solution Archive) includes a couple of non-essential informational moves, and will still finish the journey in 70 days. I think I've filled in the SoftSide series gaps I created by jumping around a bit a month or so ago -- we now have games #1 through #7 covered, but these are pleasant and generally straightforward adventures and I will probably be taking another one on in the near future.